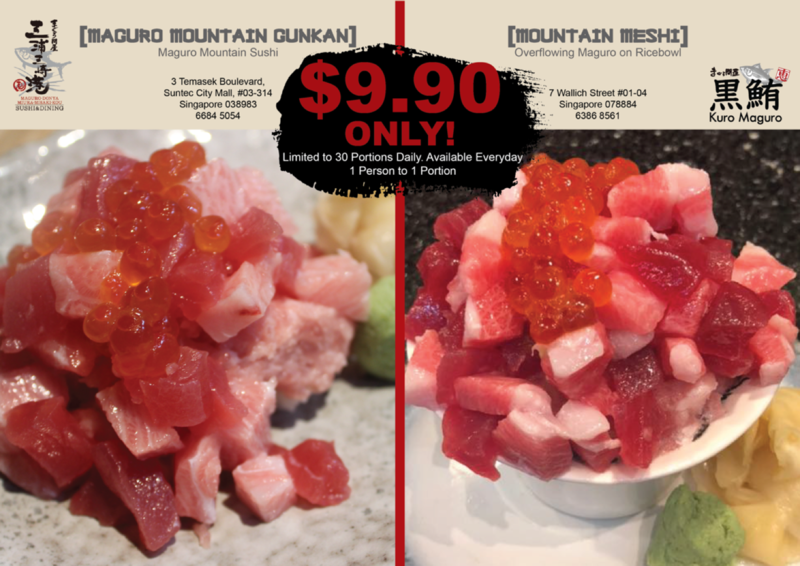 Maguro Donya and Kuro Maguro launches Maguro Mountain Sushi and Overflowing Maguro Ricebowl at only S$9.90! Be amongst the first in Singapore to savour new top-quality maguro menu items by Kuro Maguro and Maguro Donya! Widely popular and known for their fresh and top quality maguros, Kuro Maguro and Maguro Donya are launching overflowing Maguro goodness respectively. 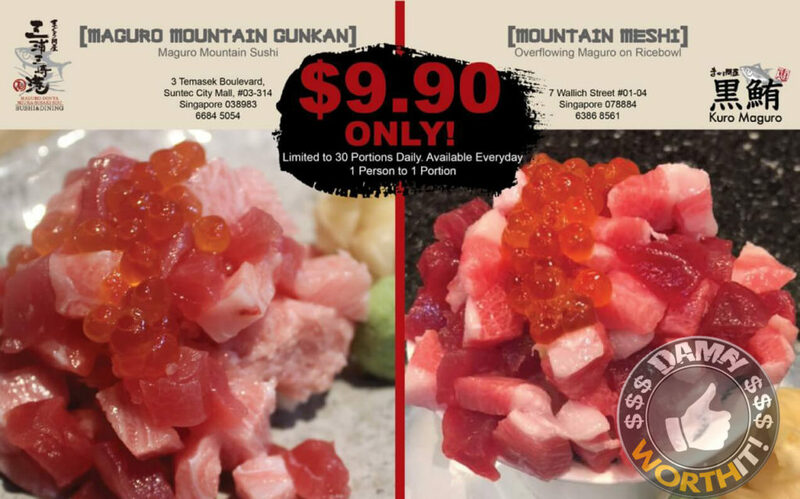 The Maguro Mountain Gunkan features priced Otoro and Akami sashimi along with Ikura atop fragrant gunkan sushi (available at Maguro Donya outlet), and the Unlimited Mountain Meshi is a delightful ricebowl filled to the brim with Otoro and Akami sashimi chunks (available at Kuro Maguro outlet). Both are priced at an exciting price of $9.90. Valid from 4 Dec – 31 Dec. Available everyday including Weekends and PHs. Limited to 30 portions, 1 person to 1 order only. Both Kuro Maguro and Maguro-Donya are concepts by Misaki Megumi Suisan, a wholesaler of maguro and sashimi in Kanagawa Prefecture, Japan. Misaki Megumi Suisan is a renowned Japanese tuna and fish wholesaler, and its trawlers have the capabilities to catch the biggest maguro in the world that weigh a minimum of 280kg. These fishes have a good amount of fat as well as lean meat. The maguro is then offered to gourmands at unrivalled prices. The restaurant imports the fish directly from Misaki Port to Singapore via ANA air freight. It also uses a technique called super frozen (超低温) to freeze its maguro. As soon as the fishes are caught on ship, they are kept frozen at – 60 degrees Celsius. As such, absolute freshness is a guarantee.